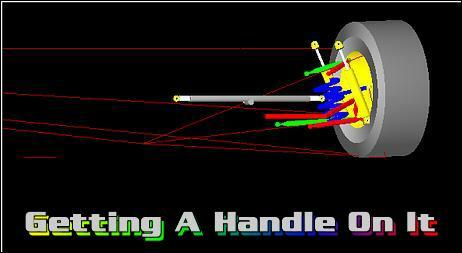 Ever wanted to design your own suspension? We take a look at the 'SusProg3D V4.14' suspension program. SusProg3D V4.14 is a suspension design and analysis program developed for suspension engineers in the motorsport arena. It's an extremely technical package, which requires knowledge of every detail of the vehicle's suspension - everything from unsprung weights to wishbone lengths to pick-up point location in relation to chassis datum. SusProg3D V4.14 is a comprehensive Windows-based program retailing in Australia for AUS$275 or overseas for AUS$250 (plus postage) through Beven D Young Automotive Books and Software. A free evaluation program (as reviewed here) can be posted or downloaded from www.bevenyoung.com.au. The evaluation program comes loaded with approximate technical data of several demonstration vehicles (Lotus Cortina, VT Holden Commodore and AU Falcon Supercars, NASCAR and more) and maintains the full function of the registered program, except it maintains fixed upright, strut and axle dimensions and preset wheel and tyre sizes. The 'base screen' for the program is the so-called Designer screen: this is where all the vital measurements and data must be entered. 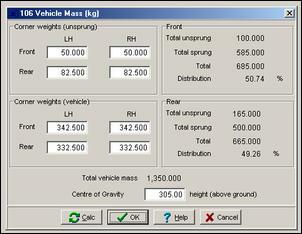 The 'basic' Vehicle data includes wheelbase, static ride height, front and rear suspension type (selectable from a pull-down list), wheel and tyre dimensions, tyre spring rate, corner weights, centre of gravity, brake force split and drive torque split (note that the program caters for front or rear-wheel-drive cars only). The vehicle datum must then be set - the X datum is the vehicle centreline, Y is the horizontal plane (usually the undertray or ground plate) and a Z reference point is also specified. The Geometry tab asks for information on the suspension mounting and steering rack ball joint locations (in relation to the aforementioned datum and Z reference point), plus the link lengths, track and alignment. The 'Instant Centres' for the swing axle and roll centre and anti-dive/anti-squat are also necessary. Once the data has been entered the Geometry-Results tab is used to reveal all of the calculated suspension values - such as mounting location and lengths of arms, chassis pivot points and more. Next, the Roll Bump tab has categories for entering max bump and droop travel (SusProg allows a maximum 45 degrees of bump and droop movement of the lower wishbone), chassis roll and wheel travel increments and roll axis. The program calculates left and right wheel camber, caster and scrub change during a corner as well as the change in roll centre offset and height. The Suspension tab takes you in to enter - not surprisingly - the suspension configuration. This includes details on the number of shock absorbers and springs, to where they're mounted, bellcrank and anti-roll bar layout - all of this is easily picked from a pull-down list. The Suspension-Results tab calculates the static spring data such as load and length. Flowing on, the Anti-roll bar tab provides inputs for roll-bar mounting positions, roll bar type and dimensions. Effective working length, inner and outer bar dimensions, arm length and offset must also be known. 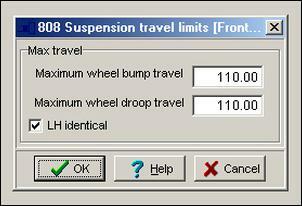 SusProg calculates information on the roll bar rate and motion ratio. The Rates tab is used to enter corner weights for the vehicle, corner weights for the unsprung mass, centre of gravity, coil spring parameters (using the specific spring rate or its frequency), max bump and droop travel (as determined from wheel travel or shock length). 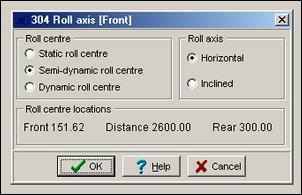 The Rates-Calc button determines the wheel rate over a number of roll, bump and droop increments. The Dynamic tabs leads to vehicle parameters, including tyre rolling radius, tyre rate, spring rate in bump and roll (measured at the wheel), anti-roll bar rate in roll (at wheel) and roll centre height. On demand, SusProg provides information on weight transfer and chassis roll. The Steering heading begins asking for information on rack and ball joint location, steering arm location, link lengths, wheelbase, max bump and droop travel and toe-out during turns. 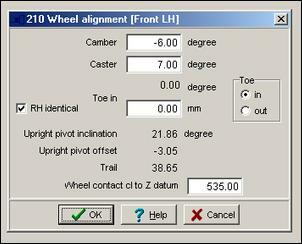 The program can be used to calculate bump steer and the effects on toe and camber. The Driveshaft menu tab adds information on driveshaft type, location of gearbox universal joint centre, driveshaft length, max bump and droop travel. The Results button reveals information on driveshaft plunge and universal joint angles. The last tab for SusProg Designer is AutoCalc. AutoCalc provides the appropriate chassis mounting points to give the listed geometry - this is the key information provided by the program. 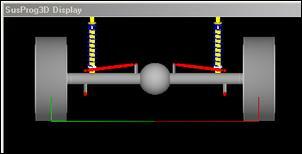 There is also the facility to enter test limits to narrow the number of acceptable options, and note that the chosen suspension set-up must already roll and bump successfully before any calculations are made. The 'second half' to the program is the SusProg Viewer. Viewer provides visualization of the suspension design that has been specified and calculated by SusProg3D Designer. Simply open the desired file and you can zoom in or out, look from above, side angles or you can pivot the view. You can also look at individual sides of the suspension, or both sides together and - impressively - you can watch the suspension and wheel movement across a number of travel increments and with different amounts of chassis roll. Viewer can show driveshafts, wheels, suspension links steering rack dampers and more, any of which can be individually deleted from view. In use, SusProg3D V4.14 has very plain data entry pages, but their benefit is enhanced operating simplicity. The 'Help' button that accompanies many of the pop-up boxes is also extremely handy, and the Help information itself is quite good. Note that it can also be configure to operate in metric or imperial units. SusProg is a little beyond most street-car enthusiasts. It's a top-end product intended for suspension engineers with the resources of, say, a professional race team. Its operation is quite straightforward, but the technical data involved is extreme.